Dorsal habitus of Charinus brescoviti sp. n. (female, MNRJ 9186). Credit: Giupponi et al. Eight new whip spider species have been found in the Brazilian Amazon, almost doubling the number of known charinid whip spider species in Brazil, according to a study published Feb. 17, 2016 in the open-access journal PLOS ONE by Alessandro Ponce de Leão Giupponi and Gustavo Silva de Miranda from Fundação Oswaldo Cruz, Brazil and the Center of Macroecology, Evolution and Climate at the University of Copenhagen (Denmark), respectively. Scientists have thought the Amazon may be home to diverse whip spider species, Amblypygi, but few have been described. The authors of this paper describe eight new species from the genus Charinus from the Brazilian Amazon: C. bichuetteae, C. bonaldoi, C. carajas, C. ferreus, C. guto, C. orientalis, C. brescoviti, and C. ricardoi. The authors differentiated each new species by the presence or absence of median eyes, the number of leg IV basitibia pseudo-articles, and the shape of the female genitalia. 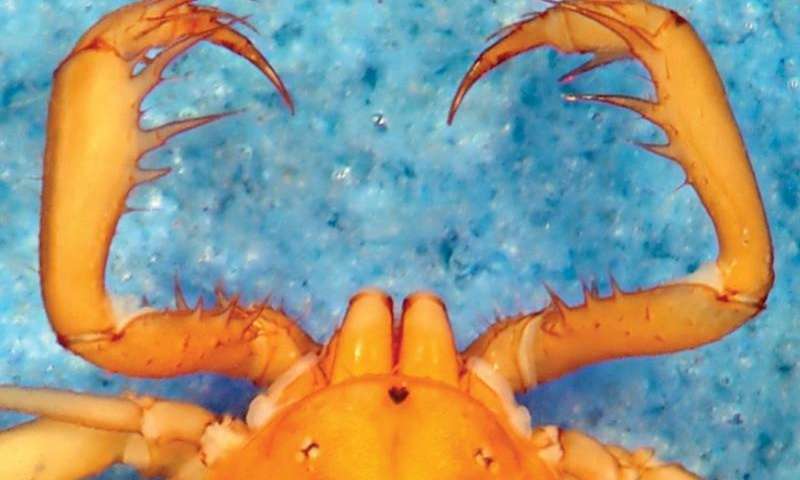 Brazil now has the largest diversity of Amblypygi in the world, with 25 known species. But the authors found that half of the new species' habitat is threatened by nearby human activities, like iron mining and flooding from the Belo Monte dam. The whip spider species are endemic to the Amazon Region, and the authors suggest conservation measures should consider preserving their increasingly threatened habitat.